Bangalore, December 29, 2016: Eureka, a hands-on science education provider, launched India’s first ever STEM club for kids. The first of its workshops was conducted at the Parikrma Centre for Learning, Bangalore. The Theme for the workshop was centered around “Pollution in the Neighbourhood”. The initiative by Eureka and DiscoverED, the STEM programs under Fitkids Education and Training saw over 1500 entrees from across 35 schools registering for the competition, out of whom, 50 children representing 19 schools across India were selected. Students who were part of the workshop worked on a real time project which aimed to measure pollution in their neighbourhood. The project which went on for a month culminated with a 3 day workshop from 27-29 Dec, 2016 with the students presenting their ideas. The best of the lot from both workshops get to be part of the Eureka STEM Class of 2017. These selected young scientists will be groomed over the next 3 years by the core team to help them excel at international science fairs like Google Science Fair (GSF) and Intel Science and Engineering Fair (ISEF). The event in Bangalore was inaugurated by Mr. RamG Vallath, a former COO of Airtel and a motivational speaker and bestselling author of children's books and Ms. Shukla Bose, Founder and CEO of Parikrma Foundation. As a part of the workshop, students have developed innovative apparatus to take the first step in combating pollution. Vishnu and Pranav, worried by the pollution overtaking the lakes, went on to a journey of identifying how organic wastes are broken down by bacteria in water, making water bodies acidic. In response, they plan on releasing a test strip to measure water pollution at a just 15 rupees. This can protect people and aquatic life from the ill effects of polluted water. Sai Rahul and Girish, who come from a primarily agricultural society of North Karnataka, know that their water bodies are suspected to be full of phosphates and other chemicals from the fertilizers. As commercial phosphate detectors cost north of INR 6,000, they plan to make a device that does the same job for just 500 rupees. Mr. Rajat T, CEO, DiscoverED, said “Fitkids is deeply focused on science learning and aims to bring out the best in the students. We are thrilled to see the enthusiasm of the children who have presented their research and innovative thoughts during the workshop. Motivation, resources and mentorship are very important for students in India today so that they can truly focus on STEM learning”. Sai Rahul Chowdhary and Girish come from a remote village in Sindhanur. They realized that the increase in use of fertilizers and chemicals in their agricultural lands were causing a decrease in the aquatic life and depletion of water bodies. Hence they have come up with a cost effective Colorimeter which can detect the presence of Nitrates and Phosphates in water which are major cause of water pollution. Varun suffers from Upper Respiratory Tract Infection (URTI). While researching on the disease he found that the problem is caused due to air pollution from gases like SO2 and NO2. Hence he decided to detect the pollutants present in the air around his Neighbourhood. He has developed a device which can detect carbon monoxide present in air. 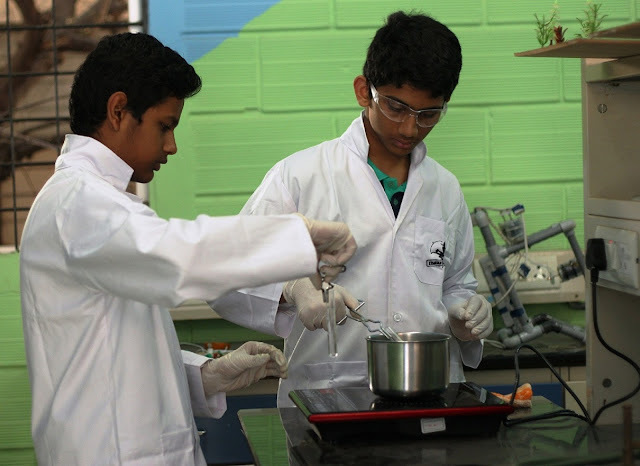 Vishnu and Pranav chose to quantify organic sewage pollutants because it is the most common type of water pollution in India. They found that increase in presence of anaerobic bacteria indicates the presence of organic compounds in water. Through various chemical reactions and procedures, they plan to device tests that will be able to detect harmful acids which are formed by anaerobic bacteria. 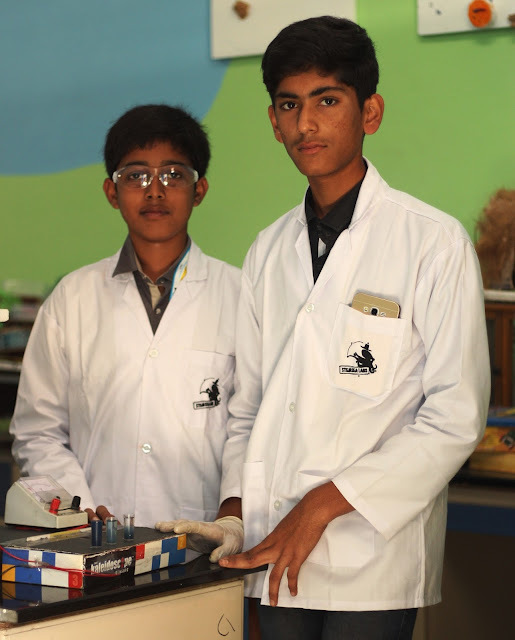 David and Vishnu started their research by observing a bad smell, which was coming from a nearby waste processing plant. They wanted to find out main components of the gases coming out of the processing plant. On further research they understood that Hydrogen Sulfide present in the gases can be harmful, even in low quantities. They have come up with a devise which consist of a gas sensor to detect the presence of Hydrogen Sulfide gas in the surrounding.